When I began exploring DAW music production, my primary motivation was to learn how to create drum and backing tracks to jam to. My search for drum tracks that sounded more realistic than drum machines led me to Acoustica Beatcraft, and later to Mixcraft. I learned there were more ways to create drum tracks than I had imagined. While things can quickly become complex, there are fairly simple ways to achieve great sounding drum tracks. 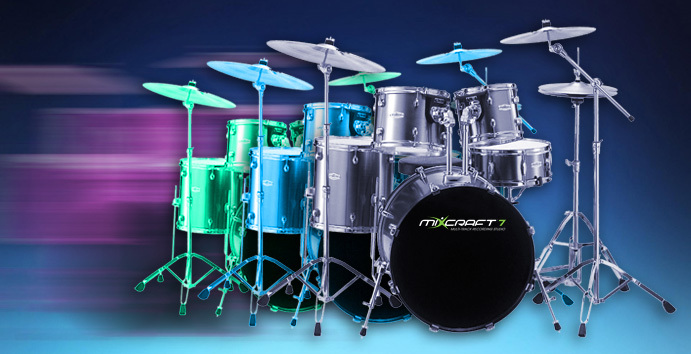 Here we’ll explore some ideas for creating drum tracks using Acoustica Studio Drums with Mixcraft’s included effects. This is certainly not the only way to create drum tracks, but will hopefully offer some ideas to inspire experimentation and result in great usable solutions. This is intended to be more about the journey than the destination! Below is a sound clip consisting of two bars of Studio Drums, followed by two bars utilizing methods I explain below. The differences may be subtle – you may need to listen on good monitors or headphones to appreciate the difference. But to my ear, the drums in the latter half of the clip sound more “open” and defined. I’ve provided a sample Mixcraft 7 project file for each stage of this presentation – let’s start by downloading MIDI Drum Project 1 and opening it in Mixcraft. In this project, I’ve created a drum track using the Studio Drums kit with all drum elements on a single MIDI track. Keep in mind that sound quality is subjective, and my idea of “good” may differ from yours. And when exploring soloed drum sounds, it’s important to remember that a great–sounding soloed sound doesn’t always sound good in an actual song, so mix and tweak within the song environment when you can. 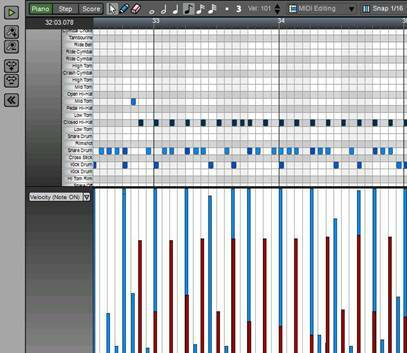 There are multiple ways to create MIDI content, such as playing notes via a keyboard or controller, programming directly into a DAW, importing from pre–programmed sources (such as third–party MIDI drum tracks), or various combinations of these approaches. I suggest experimenting and finding the method that suits you best. For example, while some play drums well on a keyboard, I can’t! Some may prefer controller pads or MIDI keyboards, whereas professional drummers often prefer a MIDI drum set, or triggered acoustic drum kit. I prefer starting a project with a very basic drum track for song timing and returning at a later point to arrange more elaborate drum tracks after the song’s parts are fairly laid out and sorted. In most cases, the core of the drum track is the kick, snare, and perhaps the hi-hat; usually the remaining rhythmic elements are embellishments or fills. Because of this, I typically focus on creating the kick and snare, hats, then any remaining drum and percussion elements. Music styles and tastes vary, some requiring very consistent velocities and tight grid timing. Others, such as in this example project, are a bit more dynamic and human. Note how the velocity data varies in this project to create a lively and interesting feel. Before moving on, we’ll try a couple of different drum kits to hear the differences in character. Click on the track’s keyboard icon and change the drum kit to “Studio Kit Processed“. I also suggest trying out “Heavy Metal Kit” and “Metal Kit Processed” settings to compare their sounds (A gong engulfed in flames also really kicks up the drama factor, but can wreak havoc with smoke detectors). For my needs, I prefer the “Studio Drums” kit. While the processed variant adds a little space and definition, the kick still sounds a little flabby for my tastes. The snare is pretty good but could use a little tweaking, and the cymbals pop out a bit… so down the tweaking rabbit hole we go! In order to separately EQ and effect each drum, we’ll place each drum element on its own individual track. Begin by creating four additional audio tracks (click the “+ Track” button at the top left, and select “Insert Audio Track” and repeat four times.) Now double-click their names and rename them “Kick”, “Snare”, “Toms”, “Hats”, and “Cymbals” (you don’t have to rename them, but it helps to keep things organized). Next, copy the MIDI clip to each track by ALT-dragging. Make sure the clip copies are placed exactly at bar one – it helps if the Snap setting is set to “Snap To Bar”. Next, you’ll want to delete all unnecessary MIDI notes from each clip. For example, on the “Kick” MIDI clip, double-click it to open the MIDI piano edit window and delete all notes except for bass drum notes. Fortunately, there’s a shortcut so you won’t have to individually delete every note. On the left side of the MIDI editing window, double-click the name of one of the instruments you’d like to delete. You’ll see the notes will darken to indicate that they’re selected. Don’t hit the delete key just yet. 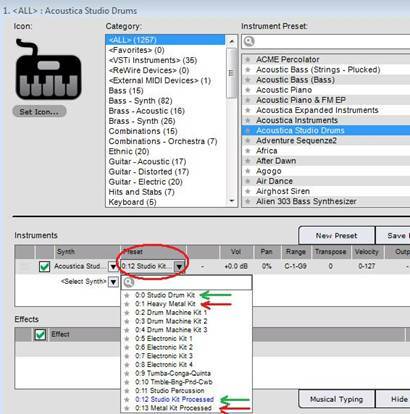 While holding down SHIFT, double-click on the name of another instrument you’d like to delete. Once you’ve selected all notes to be deleted (i.e., all notes except for kick drum notes), hit the delete key. If you make a mistake while selecting, you can always deselect all notes by clicking an empty area in the piano roll grid. This editing has to be done carefully to prevent any rogue or duplicate data on neighboring clips. It might take some practice! You can now better balance the instrument levels using each track’s volume slider, and have tremendously increased flexibility. The next step is where the mixing fun begins. In this Mixcraft project version I added various processing to the tracks, experimenting with basic EQ, compression, and reverb to sculpt the individual instruments. For instance, I used some EQ to pull up the attack (beater) and body of the kick while reducing midrange flabbiness. This often has the added benefit of making room for bass guitar or other bass frequencies later in a mix. I also added a little compression and reverb to the snare to give it more space. Explore this Mixcraft project version for more details. One element that’s still missing is the sense of overall space typically provided by overhead or room mics in a drum recording session. I simulated this is by grouping all five tracks into a Submix Track, then adding a small amount of reverb by inserting an Acoustica Reverb plug-in on the Submix Track’s effects insert. You can do this by clicking “+ Track” in the top left corner and choosing “Add Submix Track”, then dragging each individual track “into” the Submix Track by dragging over it (you can tell a track is contained within the Submix track, because it will indent a bit). The important thing here is to set the reverb plug-in’s dry mix control to 100% (so we get all of our dry drum sound), and set the wet mix very low – I set it to 3% here. Setting the wet mix to higher ratios can result in some seriously boingy kick drums, which usually isn’t what you want. This method might be all you need for some situations, but honestly, I wasn’t really happy with where it was going. My personal preference is to use send tracks for each individual track. The idea is to create a separate mixer bus called a Send Track for an effect, and “send” the signal in varying amounts from each track individually. Using a large reverb as an example, you could send a lot of snare signal to the reverb effect while sending very little of the kick drum (or none at all). Though not as simple as the “all-in-one” submix track approach explained above, it offers unprecedented flexibility with a more “unified” or tied together end result. To create a Send Track, click on the “+ Track” button at the top left and select “Add Send Track”. Double-click the name of track and name it “Reverb Send”. It’s a good idea to place Send Tracks at the very top or bottom of the track list to keep them visually grouped together. Now click the Send Track’s “fx” button and choose the effect you’d like to add. Here we’ve used Classic Reverb and chosen the “80’s Snare (Send)” preset. When using Send Tracks, it’s important to understand the significance of why that preset has “(Send)” in its name – it means a plug-in’s direct/effect mix ratio control is set to 100% wet. This is because the dry signal is already present in the mix, and the amount of effect you’ll hear in the final mix will be set by amount of signal sent to the Send Track (hold on, we’re about to explain how to set this! ), as well as the Send Track’s own volume fader. If an effect’s direct/effect mix is set to anything other than 100% wet when using a Send Track, things can get confusing because you’ll hear the dry signal from the original track combined with some amount of dry signal from the plug-in effect. Take our word, you’ll be a happier (and saner) mixer with Send Track effects set to 100% wet! Now let’s send some of our snare drum signal to the Send Track reverb. Click the Mixer tab at the bottom of the screen. At the top of each channel strip, you’ll see a red send level knob. This lets you dial in how much signal each track sends to the Send Channel effect. If you’re using more than one Send Channel, you can click on the pop-up menu directly beneath where it says “Send Channel” at the left of the mixer to select which Send Channel the red channel strip send knobs currently represent. You’re free to create as many Send Channels as you like. In this example, I’ve created one for reverb and another drum compression bus where all of the drum kit elements are fed to “glue” together and unify the sound. – There is no kick drum sent to the reverb, and I’ve EQ’d the low end out of the reverb Send Channel, because low frequencies from a reverb can quickly create a lot of muddiness. – The bus compressor settings aren’t real aggressive, I just didn’t feel it was needed for this project. But note that the compressor attack speed isn’t very fast; this means the compressor doesn’t “act fast”, so a lot of the drum attack transients still come through. There is quite a bit of compression applied to the snare and some to the kick, adding a hint more “body” and creating a fuller tone. – There’s also a touch of panning, in order to add a little width for interest. I hope this gives some ideas and inspiration to experiment with and develop great new drum mixes of your own! Thanks again for your guest blog! (= Hopefully, some other “Mixcrafters” will find this useful. Thanks Joseph! I hope so too! One word springs to mind, WOW. I must admit to have only gone through a part of this blog so far but I have learned a lot. I think I will have to take a few days to fully absorb all of the extremely useful information. Right at the top of my MixCraft “to do list” is learn more about drums and this blog is a major step forward for me. I have 3 things to say. Thank-you, thank-you and thank-you! Hey, thanks to everyone for the complements, much appreciated! Just wanted to drop a reminder, that if anyone has any questions on this, or any other Mixcraft question, or even a suggestion for future blogs and tutorials- Hop on over to the Mixcraft users blog and lets talk! Oops, I meant users forum! Hi there,I check your blogs named “Off The Beaten Path – Acoustica Blog | Mixcraft Music Recording Software” on a regular basis.Your story-telling style is awesome, keep doing what you’re doing! And you can look our website about تحميل اغانى. Performed in time, surgery might be able to resolve physical injury or organ trauma such as a ruptured bladder فروشگاه اینترنتی لباس. Medication might address any bacterial infection that is causing excess fluid production.